Largehearted Boy: Book Notes - David Hinton "I Ching"
Book Notes - David Hinton "I Ching"
David Hinton's new translation of the I Ching takes a poetic approach rather than academic, and reveals the beauty of its language. "Hinton’s translation of the ancient glosses on the various hexagrams of the I Ching are clear and often quite lovely ('At rest in obstruction, a great sage finds good fortune. Is he lost, is he lost? He’s tethered always to the mulberry burgeoning from seed,' and so forth), but the best part of his I Ching, for non-cleromancers, will be the subtle and energetic ways he understands the text's deeper ways of changing its readers:"
My most recent book is a radically new translation of the I Ching: literary and poetic, rather than scholarly and full of lengthy commentaries. 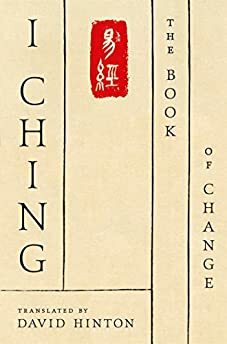 I Ching translates directly as The Classic of Change, and it is the ur-text of Chinese spiritual philosophy: Taoism and Ch'an (Zen) Buddhism. Though it's over 3,000 years old, it describes the universe in a way that is remarkably consistent with modern science: as a female, generative organism, an ongoing process of transformation in which individual things are born, evolve through their lives, die, and then become the material for the new birth of other things. This includes, by the way, our mental processes. Change, then, as the fundamental nature of reality (both subjective and objective): hence, The Classic (I) of Change (Ching). By consulting the I Ching you find your place in the ongoing transformation of things, as well as a philosophical attitude that will serve you best in moving forward. So, reading or consulting the book is an experience of consciousness woven into the Cosmos, into the spontaneous unfolding of creation. Translating this worldview I sometimes thought of Beethoven's 5th Piano Concerto, that transition where the quiet second movement falls into silence and the piano begins inventing the third movement. You can hear creation happening there, slow and tentative, music growing back out of the silence, until suddenly the third movement explodes into existence. I also listened to Mahler's symphonies, especially 1 and 5, that often feel to me like vast cosmological processes, material evolving through one form after another, an ongoing process of creation. This organic process of transformation is sometimes slow, sometimes dramatic and surprising—and throughout it is suffused with the pressure of wildness or even chaos. This is probably a perverse way of hearing the achingly romantic Mahler, but it may grow out of inhabiting that generative worldview found in the I Ching: a worldview that sees the Cosmos whole, the larger process to which our human drama belong. But primarily, I listened almost obsessively to the improvisational music of Keith Jarrett. Jarrett has produced acres of exquisite music. Remarkable enough, but he adds a new dimension: the adventure of creative unfolding, that same generative unfolding that is described as the fundamental nature of reality in the I Ching and the tradition of Taoist /Ch'an spirituality that followed. This takes the form of improvisation, which is of course central to jazz; but in Jarrett it happens on a vast scale, and it's so compelling and original that it seems more like spontaneous composition. I listen to his trio music most, but this cosmology of spontaneous creation is most famously apparent in his huge solo concerts. The almost embarassingly famous Koln Concert, for instance, which begins with a four-note phrase borrowed from the warning bells used at the Koln Opera to announce the beginning of a performance. If you turn up the volume for the first 30 seconds, as Jarrett repeats the phrase and begins altering it, you can hear muffled laughter in the audience; and from there, twenty-six minutes of music unfurls. The magic is that in listening you participate in the adventure, always there on the edge of creation, wondering what will come next, how it could possibly keep unfurling (sometimes boring and sometimes breathtaking), how it could possibly be so wondrous. And isn't that how the Cosmos is for us: unfurling through days and nights, seasons and years, life and death and birth, ideas and continents drifting through one form after another, species extinction and creation; stars dying in nebular explosions and forming again from the leftover dust?